Mainichi Byakudankoh means "Everyday Sandalwood." the 60 stick pack is a nice choice for starters and/or as a gift. Byakudan /sandalwood, has been used from the dawn of human history, and is known for its sweet and rich scents. Today, Nippon Kodo has adapted the essence to suit modern tastes. Enjoy its full character! Byakudan /sandalwood, has been used from the dawn of human history, and is known for its sweet and rich scents. Today, Nippon Kodo has adapted the essence to suit modern tastes. Enjoy its full character! Nippon Kodo was founded over four centuries ago. 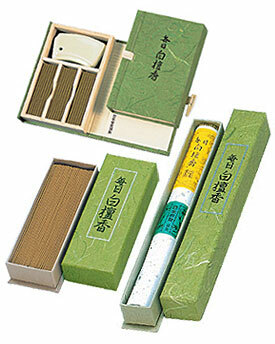 It began producing koh (high quality incense) for the Emperor of Japan. Today, Nippon Kodo continues this tradition of excellence with a wide variety of contemporary and traditional incense for every occasion and taste for all people all over the world.